IMPORTANT! Back up your existing installation of Bamboo before attempting to upgrade to Bamboo 2.7! Significant changes will be made to your pre-existing Plans when they are migrated to the enhanced Plan structure for Bamboo 2.7.
recover your Plans if you encounter a problem during the Bamboo 2.7 upgrade process. When backing up Bamboo, we strongly recommended backing up your xml-data directory before proceeding. For full instructions please follow the Bamboo upgrade guide. If you are using plugins, please make sure that your plugins are compiled against 2.7 before upgrading. Before you upgrade, please read the following important points that relate to Bamboo 2.7. Please set aside some time for Bamboo to migrate Plans to the enhanced Plan structure as this process may require a significant period of time to be completed. As a guideline, when we upgraded a Bamboo 2.6.x server running on an 8 thread/core machine with approximately 100 Plans (45,000 results), it took us approximately 2 hours to complete the Plan migration process, plus an additional 2 or more hours to complete the Bamboo re-indexing process. The time it will take you to upgrade to Bamboo 2.7 ultimately depends on your hardware and the number of pre-existing Plans requiring migration. Each Plan configured in a Bamboo 2.6 (or earlier) installation will be migrated across smoothly into its own enhanced Bamboo 2.7 Plan. After migration, your plan will consist of a single Default Job in a single Default Stage. You will need to upgrade your remote agents if you need your Plans/Jobs to access Mercurial repositories (via SSH authentication using key files with passphrases). For full instructions please see Upgrading remote agents for Mercurial. You should also make sure that the Mercurial capability is properly configured both on the server and for agents. All Bamboo versions using MS SQL 2005 and 2008 demand Read Committed with Row Versioning isolation level. Before starting the upgrade process ensure that your current Bamboo MS SQL database is set to use Read Committed with Row Versioning as its isolation level. If you are planing to restore a Bamboo Backup Zip, ensure that the new database will have this isolation level as well. For instructions on how to set this isolation level, please see Microsoft+SQL+Server+2005+and+2008. As a result of the enhanced Plan structure in Bamboo 2.7, you will notice that some configuration settings associated with your old Bamboo Plans are now only available when viewing the Default Jobs of these Plans (following the upgrade). Hence, you will need to 'drill down' to an upgraded Plan's Default Job to access some of the configuration settings you would normally have accessed when editing/configuring a Plan in Bamboo 2.6.x or earlier. You can easily access a Plan's Default Job or any other of its Jobs, by viewing the Plan's Plan Summary tab and clicking the Job's name in the Stages section of that page. 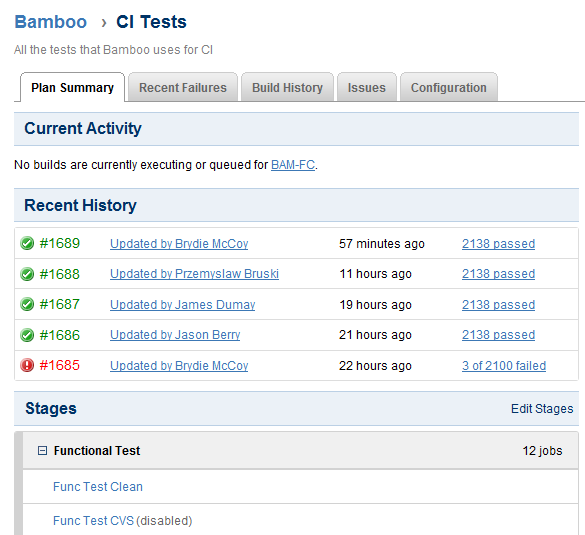 Sometimes we find out about a problem with the latest version of Bamboo after we have released the software. In such cases, we publish information about these other known issues in the Bamboo Knowledge Base. Before you begin the upgrade, please check for any of these other known issues in the Bamboo Knowledge Base first and if provided, follow the instructions to apply any necessary patches. If you are a Bamboo plugin developer, please refer to our Changes for Bamboo 2.7 guide, which outlines changes in Bamboo 2.7 that may affect Bamboo plugins compiled for Bamboo version 2.6.x or earlier. If you're upgrading from versions prior to 2.6, please upgrade to 2.6.3 release first before upgrading to 2.7. As stated above, 2.7 involves major changes to the database structure and a phased upgrade is recommended. If you are upgrading from Bamboo 2.5 or earlier, you will need to set aside more time for Bamboo to migrate its test result data stored in XML files on the filesystem into the database. This time is additional to that mentioned above. In particular, if you are upgrading from a version of Bamboo prior to 2.0, please ensure that you upgrade to Bamboo 2.0.6 first before upgrading to Bamboo 2.6.